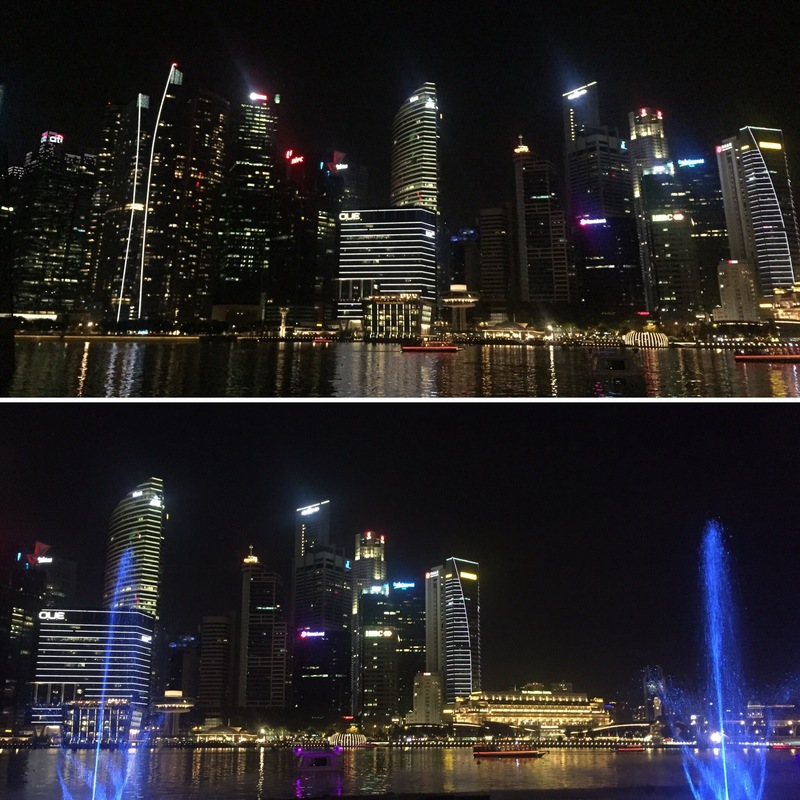 The 14th October 2017, our second full day in Singapore, marked one year since we left home to go travelling. It had been a fantastic year packed with new experiences, adrenaline and new friends. 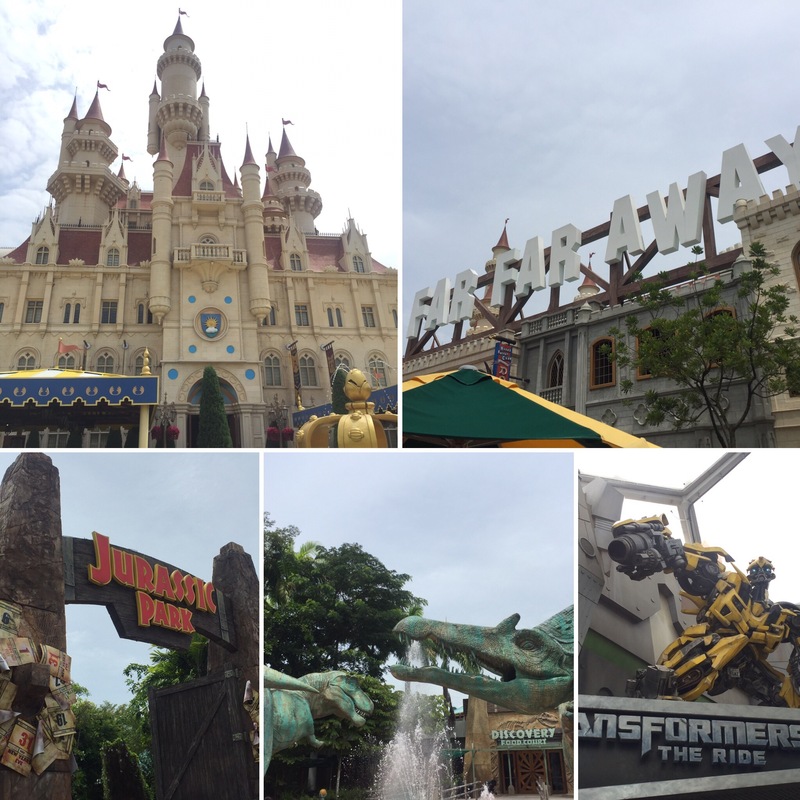 For our 366th day away from home, we went to Universal Studios which is on Sentosa Island. The island has a bunch of resorts, restaurants and other attractions and you could likely spend a week here on its own (as well as spend an extortionate amount of money). 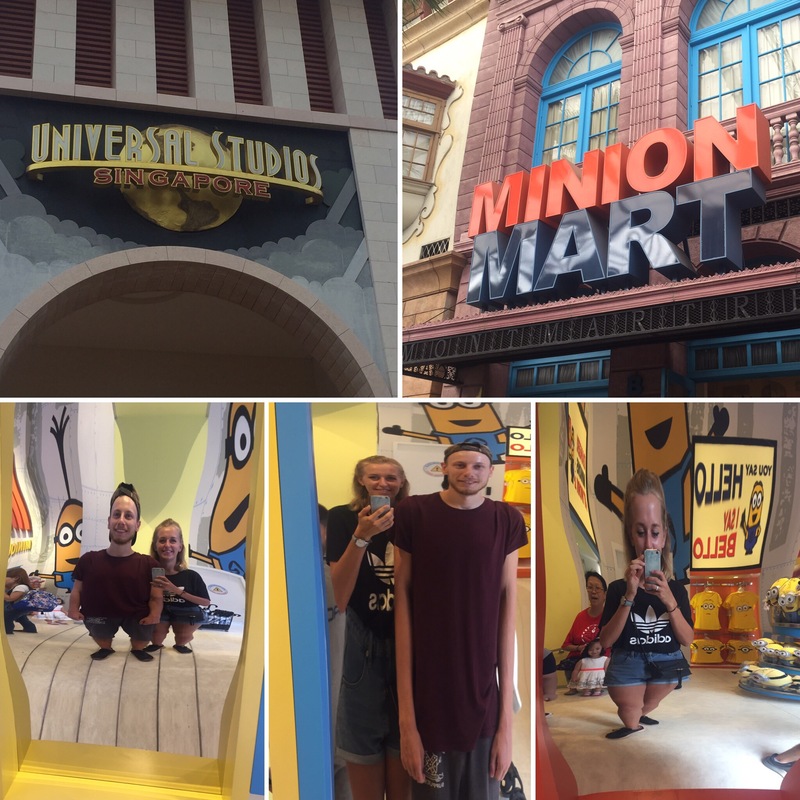 We had a really good day going through the different sections of Universal from Madagascar to Far, Far Away, Egypt to Jurassic Park and into space. 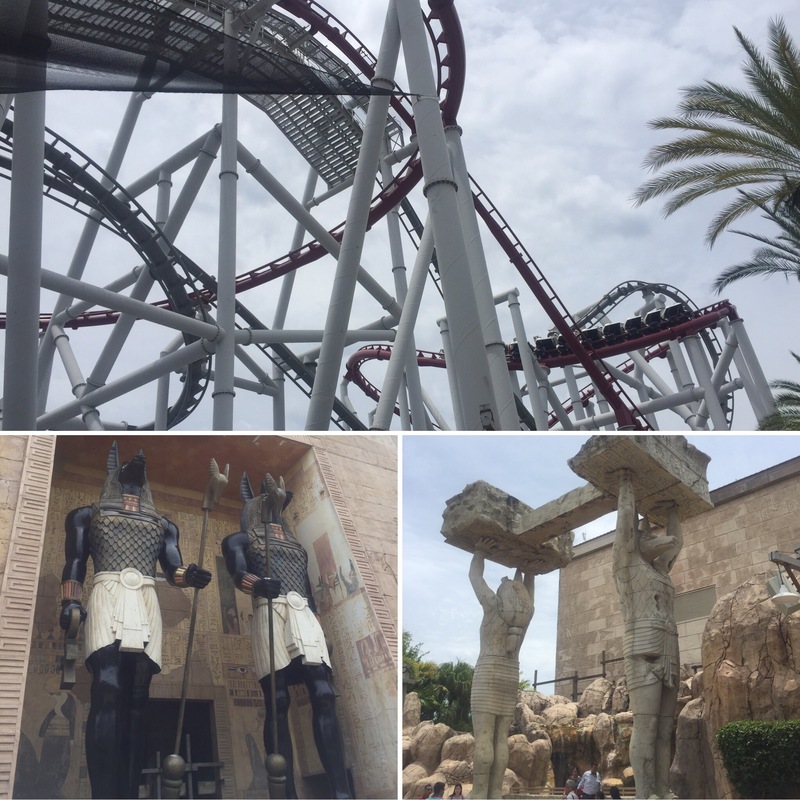 One of our favourite rides (we went on pretty much all of them) was the Mummy ride which we went on twice – it had you in the dark a lot so that you didn’t really know where you were going. Our absolute favourite ride though was Battlestar Galactica. This was two rides in one as it had a human team and an alien team both with their own rollercoaster that ran at the same time as one another and were intertwined so that it was like the two were fighting. We went on the blue ride first which was the ‘human team’ and had a great time! But it was the red ride – the ‘alien team’ – that was the best ride of all. This ride took you upside down, down massive drops and on a big loop. We loved it! We ended up going on the blue roller coaster twice and the red roller coaster three times before we left that day. 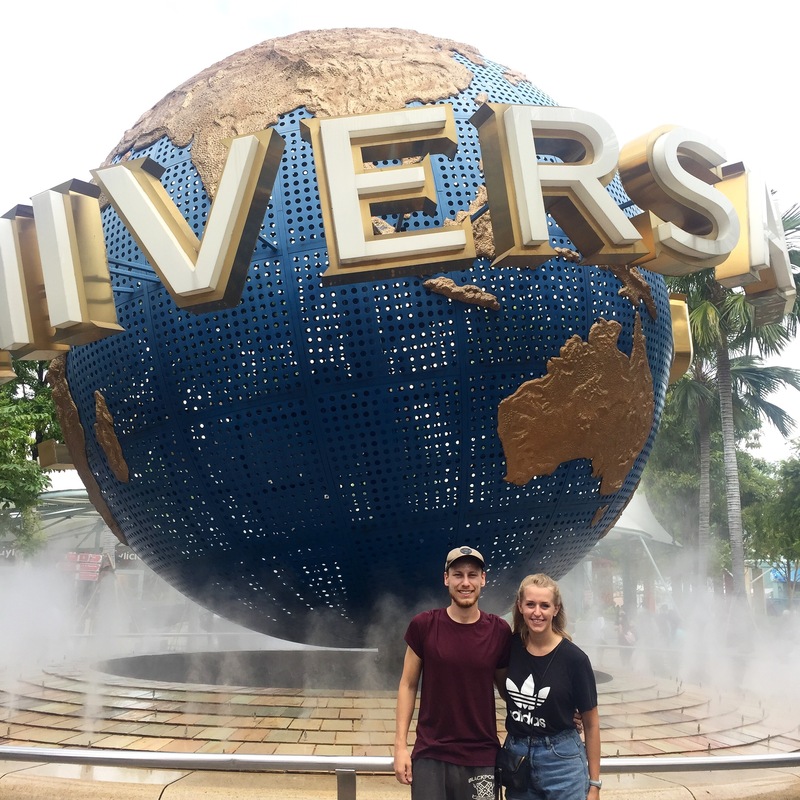 I’ve never been to the Universal Studios in Florida but Niall has and he says that the Singapore one is a bit smaller and with more child friendly rides (there were only a few that younger children couldn’t go on). 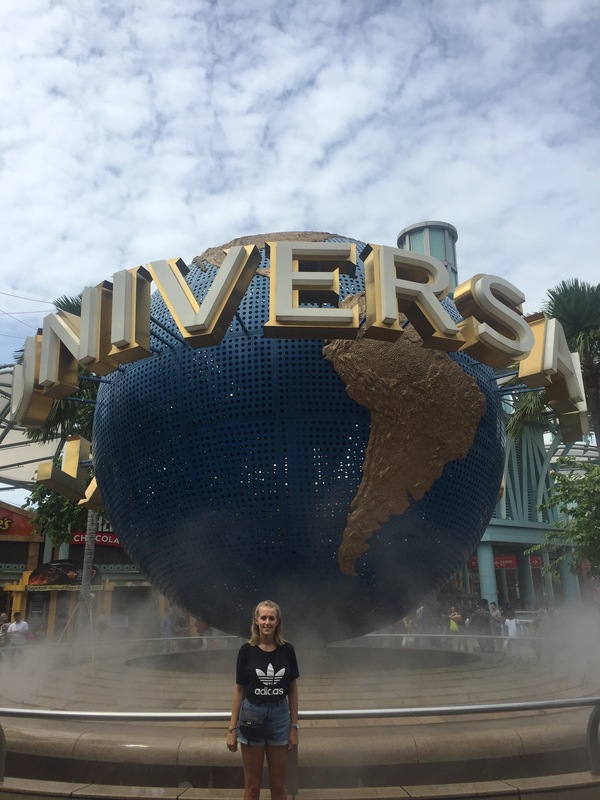 We had so much fun at the Singapore Universal that the American one must be amazing!! After our day at Universal we headed into the city to get some food (we hadn’t eaten since breakfast). 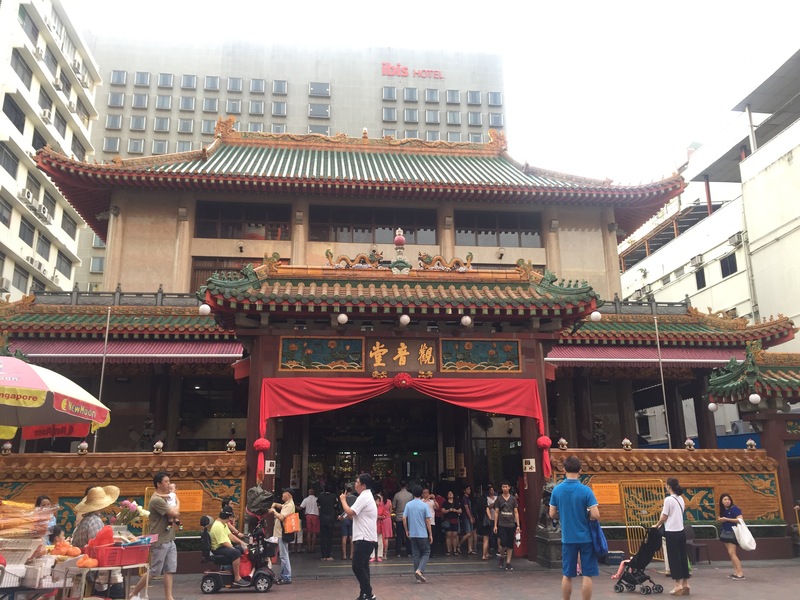 We headed into China Town and on the way for food visited two temples. 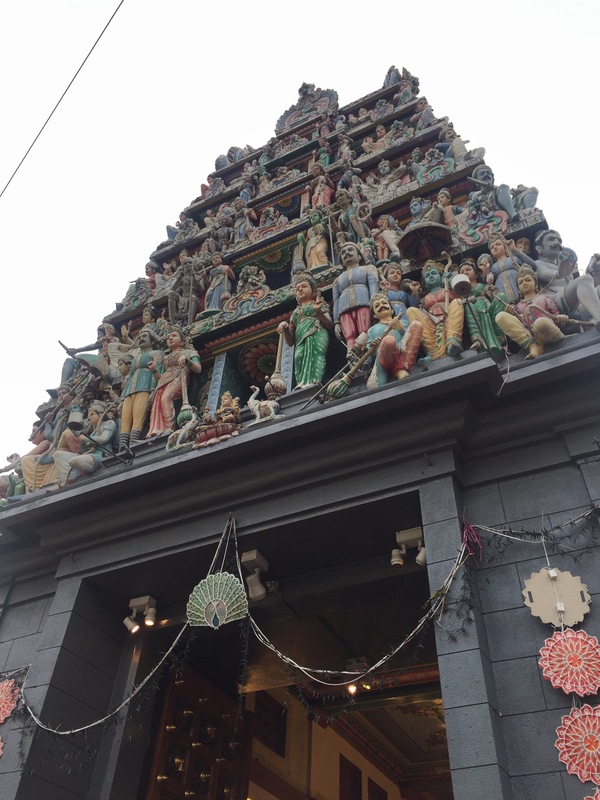 The first was called Sri Mariamman Temple which was covered in intricate statues of Hindu deities and is Singapore’s oldest Hindu house of worship. 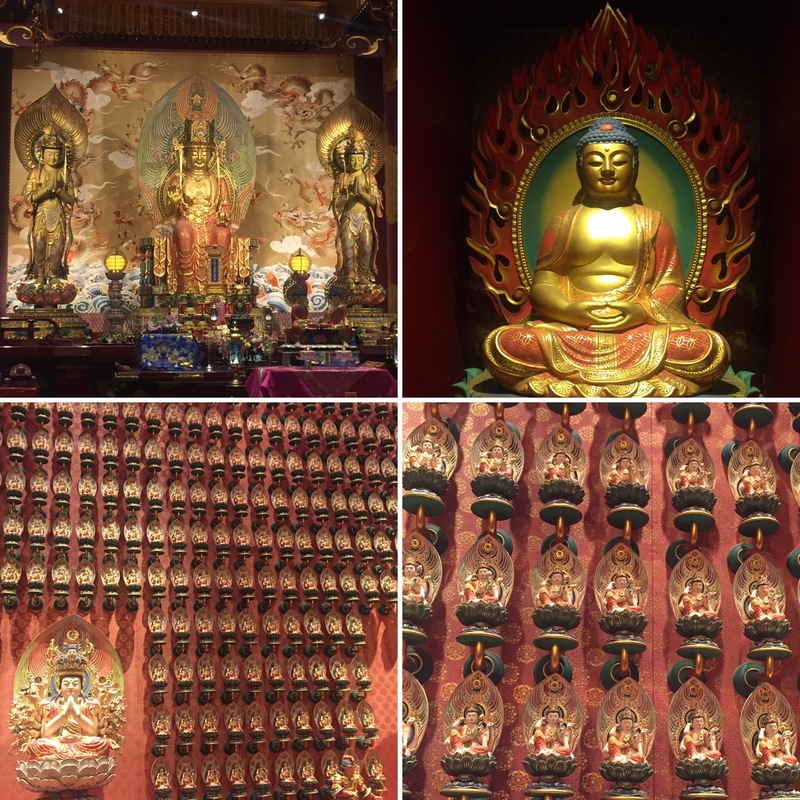 The second was the Buddha Tooth Relic Temple and Museum and was full of pictures and statues of Buddha all over the walls from floor to ceiling. It claims to have a sacred tooth of the Buddha there but there are some doubts (as with any claim like this) whether this is authentic. 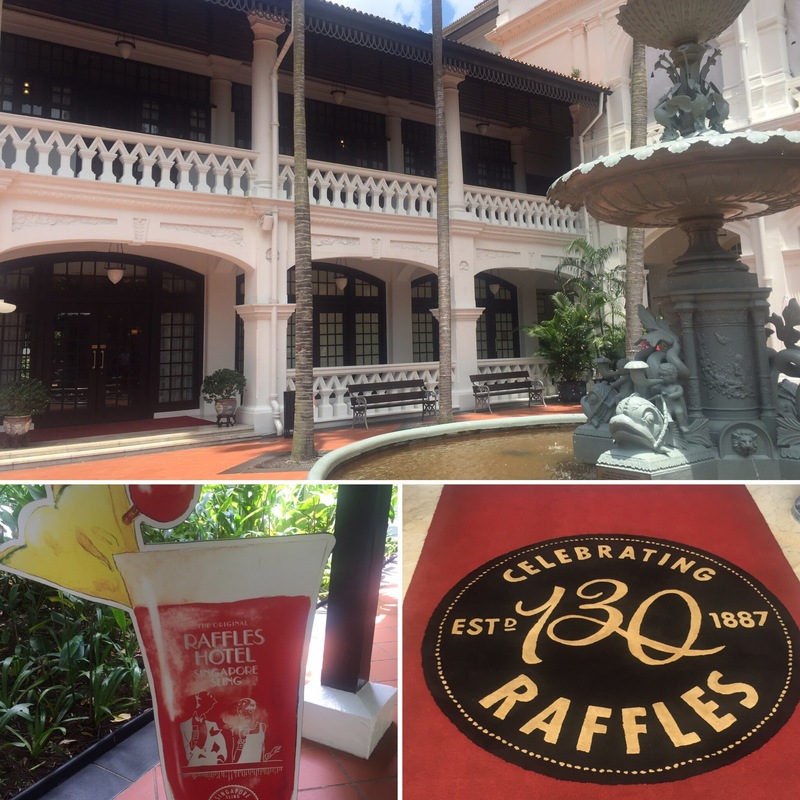 We also went to the Raffles Hotel but it was under construction so we couldn’t see much of it. 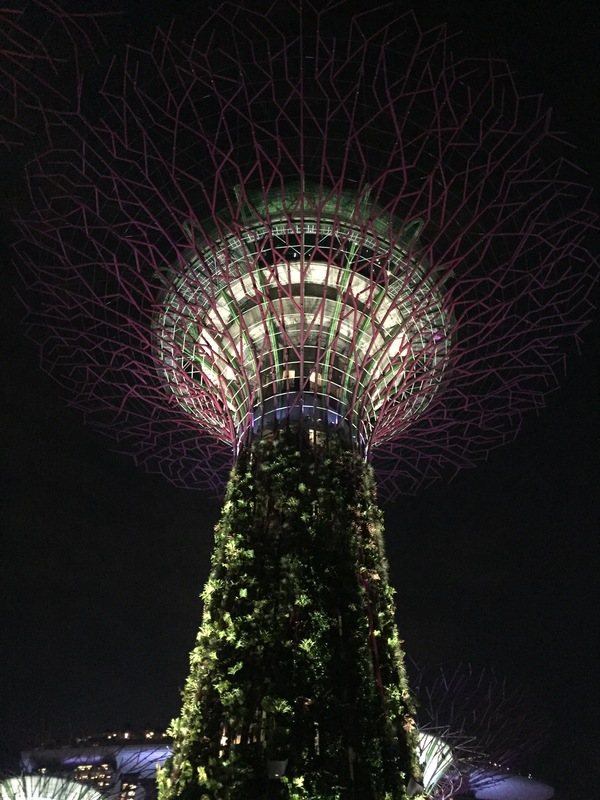 This is the home of the Singapore Sling cocktail but it was over 30 Singapore Dollars which really wasn’t within our price range just for one drink. 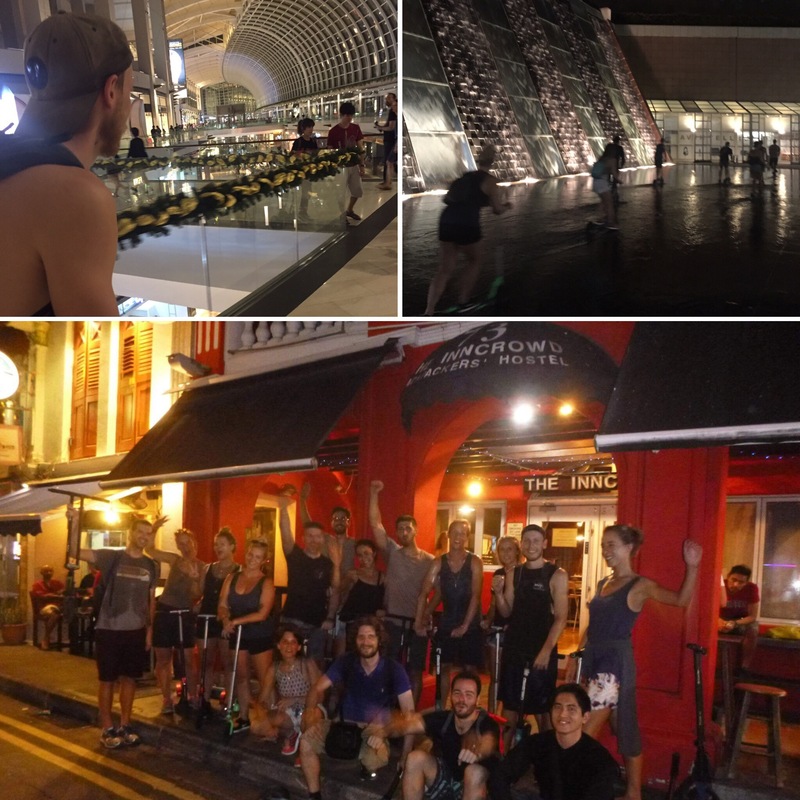 We went to two food courts that night as the first, Maxwell Road Food Centre, had a number of stalls closed meaning that they didn’t have anything vegetarian for me to eat – Niall enjoyed his food from there though. We then left China Town and went to a massive food centre called Lao Pah Sat which has all types of food in it where I was able to find something to eat which was also really tasty. 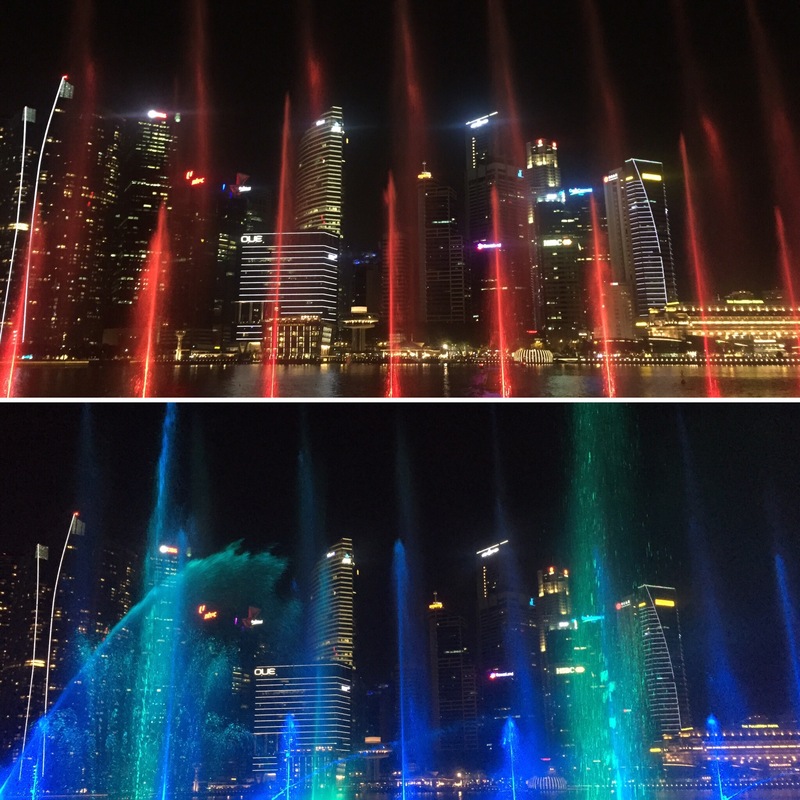 After tea we headed to the the river by Marina Bay Sands to see a free water and light show that happens there a couple of times a night. The show was called Spectra and it was really good. 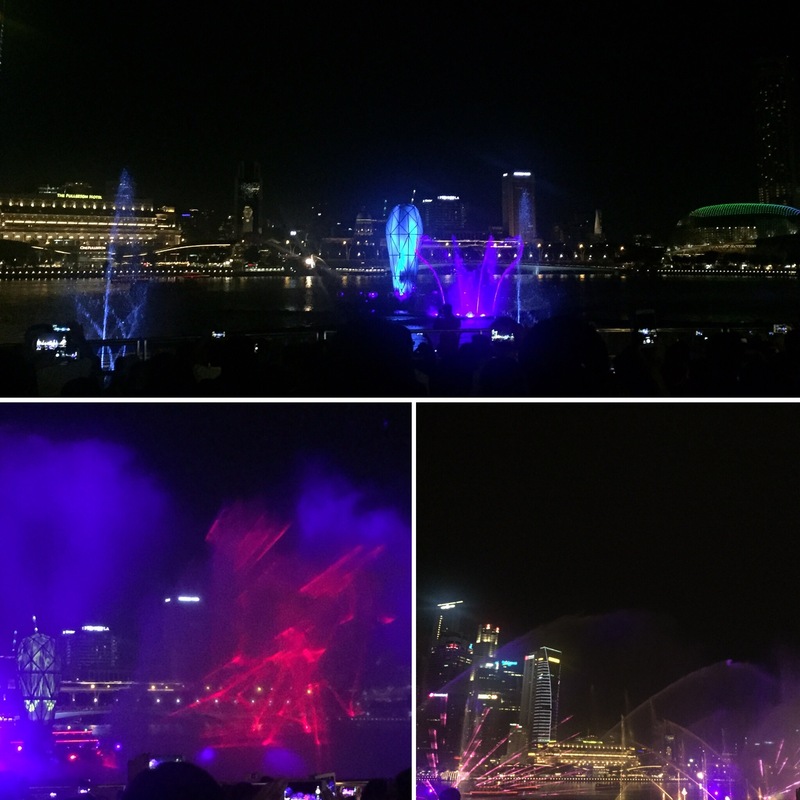 They played a soundtrack and an array of fountains lit up and made different shapes to the music all with the city skyline as the backdrop. 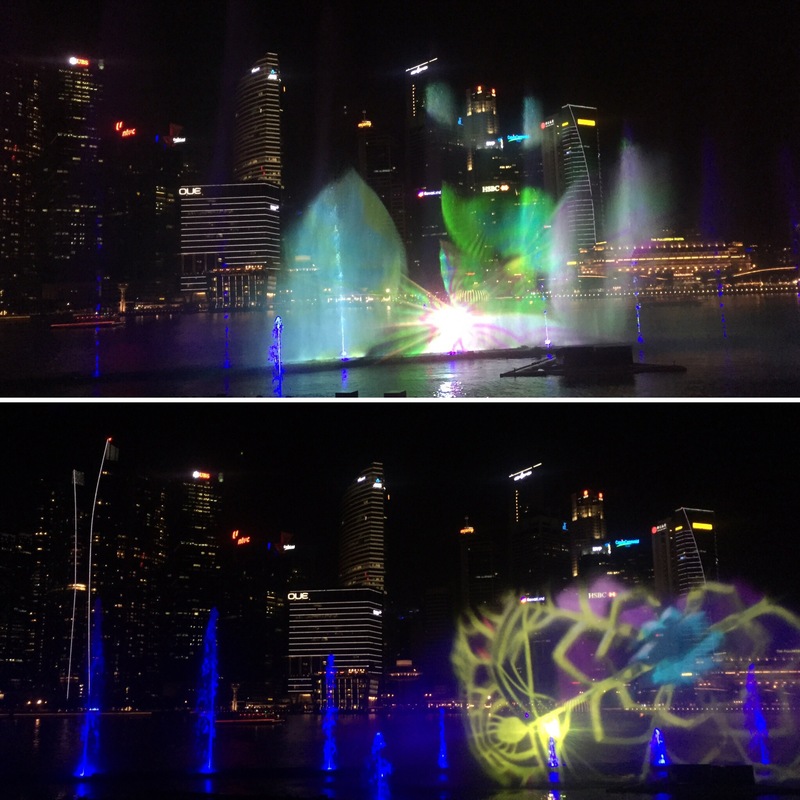 This was pretty on its own but then a huge sheet of water was sprayed into the air and a picture show of a bird flying through the air as well as lights and colourful patterns lit up the sky in front of us. I had never seen pictures be created in the water before like that and it’s safe to say we were really impressed! 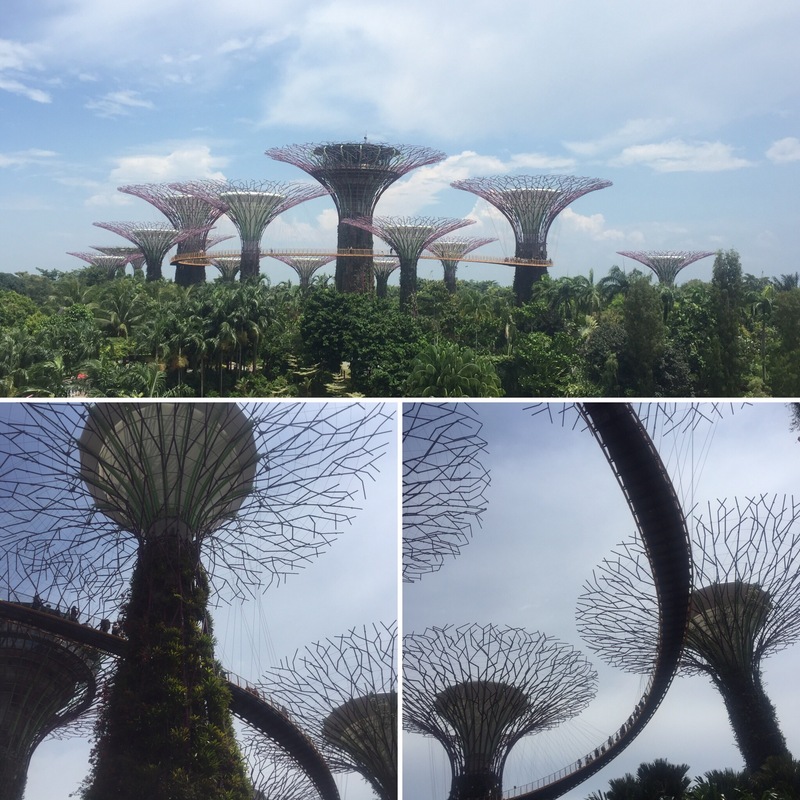 On our last day in Singapore, we took the day a lot more chilled and headed to the Gardens by the Bay to see it in daylight (having only seen it during the light show at night). It was a really hot day and we were quite tired from having a few very busy days walking everywhere so we didn’t end up spending a really long time here. 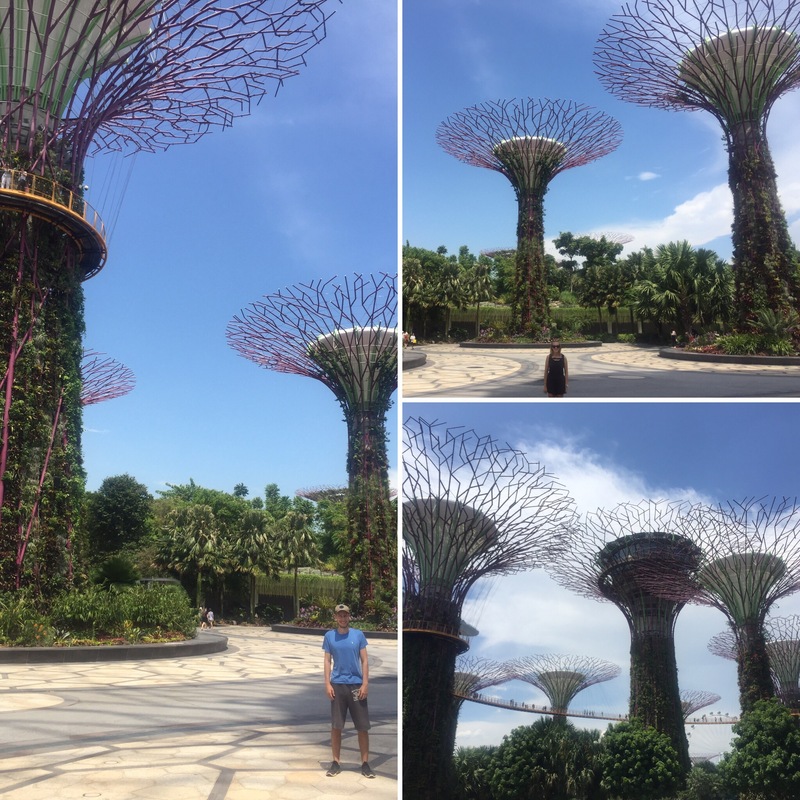 The gardens are so pretty and have loads of different sections to sit in and walk through. As it was a Sunday there were lots of families and groups of friends with picnics sitting in the shady sections of the park which was nice to see the place being used so much by the locals as well as tourists. Our main activity for the rest of the day was a free scooter tour ran by the hostel in the evening. 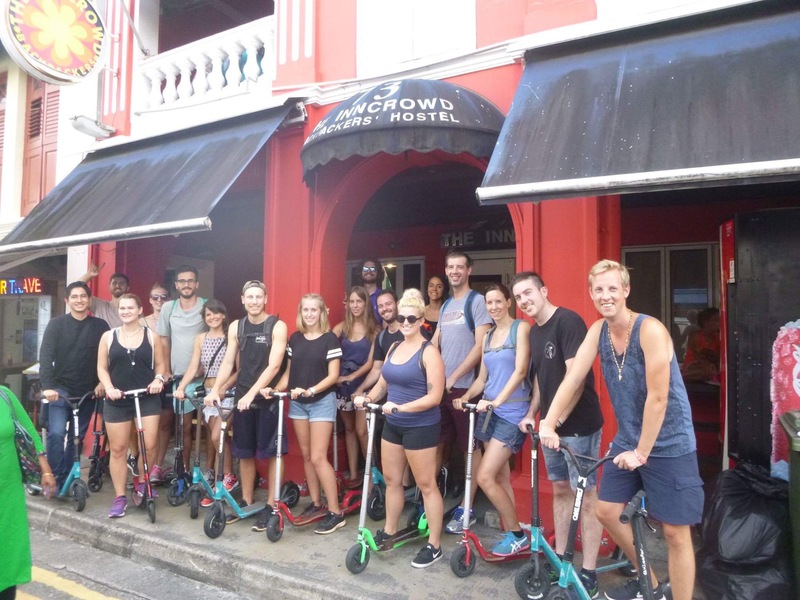 The hostel run the tour a few times a week and provide the scooters which are like the ones you have as a child – so many people in Singapore use these to get around the city as well, although they are mostly electronic ones. There were around 15-20 of us doing the tour and we would be out for around five hours! Our first stop was to have a taste of some durian. This is a famous fruit in South East Asia because of its smell. 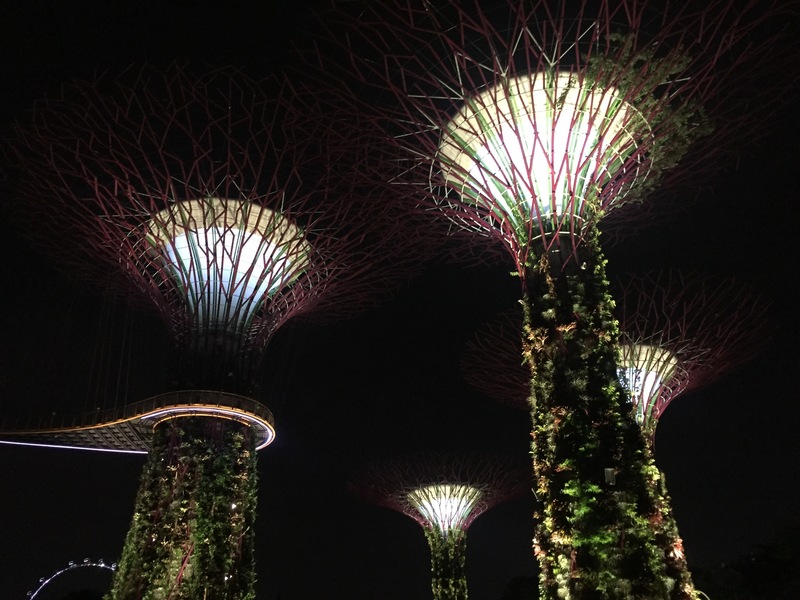 The durian fruit has a very strong, very bad smell to it. The smell is so strong that a lot of shopping malls and train stations have banned you from having them there at all! The fruit is a greeny, brown and sort of spiky on the outside and light yellow inside. We hadn’t tried it before and expected the worst but it didn’t taste too bad. I don’t think I’d ever choose to have it over other fruits as it doesn’t really have a strong taste and the texture is a bit strange and kind of mushy. Apparently, durian is incredibly good for you and is filled with lots of antioxidants and vitamins. 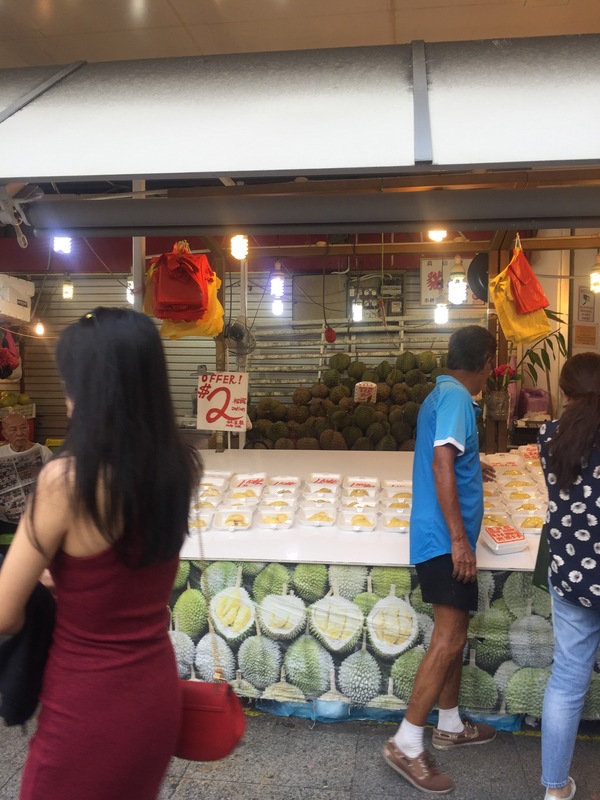 Our guide told us that his wife and her friends have durian parties where they all buy loads of durian and eat it all and there are also all you can eat durian buffets! 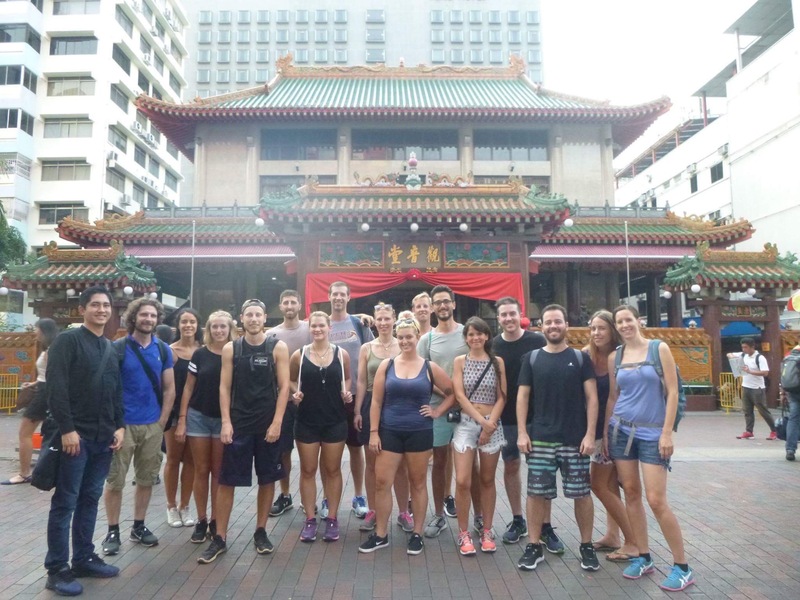 Our next stop was to the Kwan Im Thong Hood Chi Temple (also known as the Goddess of Mercy temple). 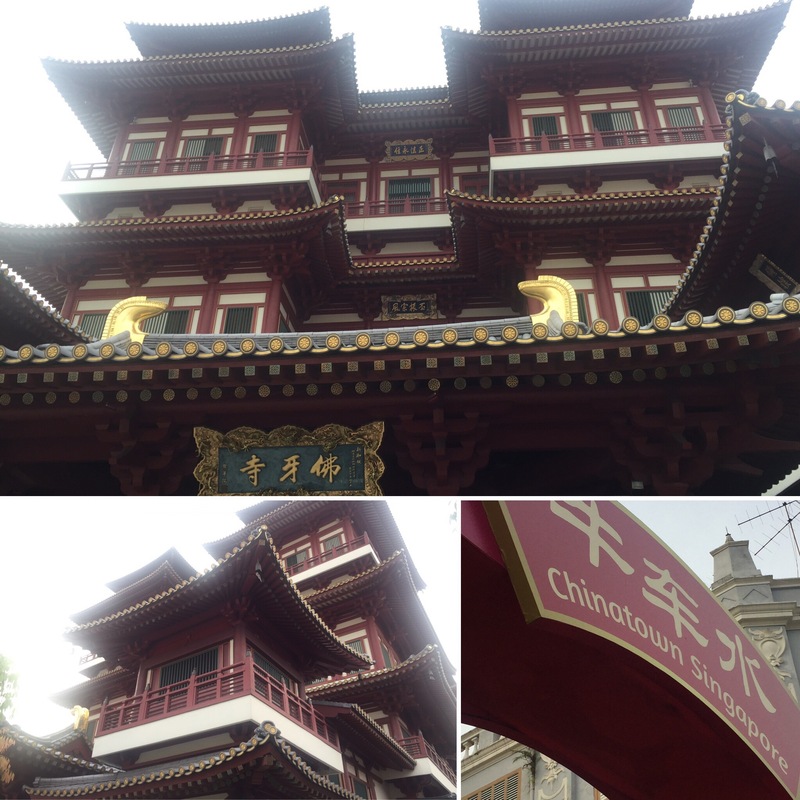 This is a Chinese Buddhist temple and we were able to go in and have our fortunes told. You are given a pot of sticks – very similar to chopsticks – with engraving on them and two half moon shaped stones. You kneel infront of the deity and shake the pot of sticks at a 45 degree angle whilst thinking of a question you would like answered (e.g. ‘Will I win the lottery?/will I find my true love?’ etc). You continue to think the question as you shake the sticks until one stick falls out – patience is needed for this bit and there is a certain knack to it. Once a stick has fallen out you through the stones onto the floor in front of you and if they land with one rock facing up and the other facing down, you will have your question answered. If they don’t and they both land the same way then you have to put the stick back into the pot and try and ask your question a different way (e.g instead of ‘will I win the lottery’ you could ask ‘will I get a lot money soon’). You do this until you get the rocks to fall the opposite way up from one another. You then hand the stick to the monk and he will give you a piece of paper with your fortune on. This looks a little like an elaborate fortune cookie with information on about what you should and shouldn’t do and will either be good, medium or bad. Niall got a medium one but I got a bad one. When you receive a bad one you’re meant to burn it to burn away the bad fortune that you have been given which should give way to some good fortune in its place. I didn’t even take a picture of the fortune to make sure it was burnt away properly (better to be safe than sorry)! 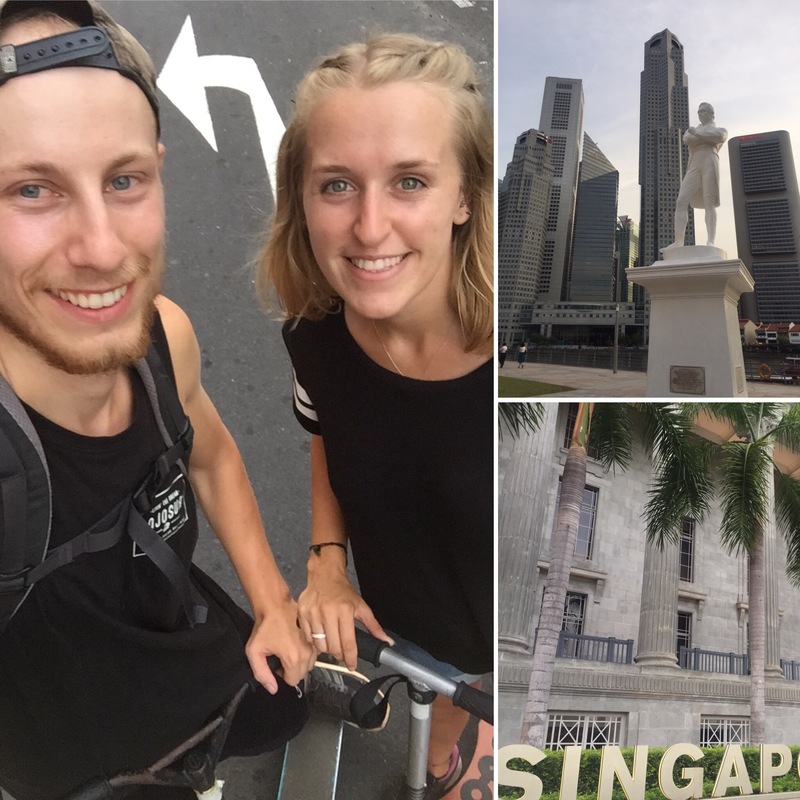 We scootered on through the city, through side streets, markets and along roads and into the civil district. This is where all the museums are but we didn’t go into any – that wouldn’t be the best use of having the scooters! 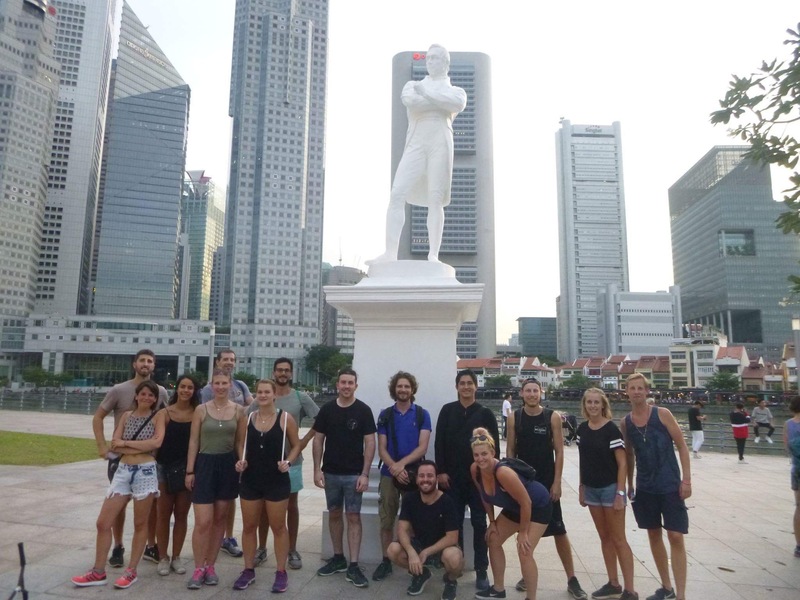 We then headed to see a statue of Stamford Raffles. Loads of things in Singapore are named after him (Raffles Street, Raffles Station, Raffles Hotel etc.) 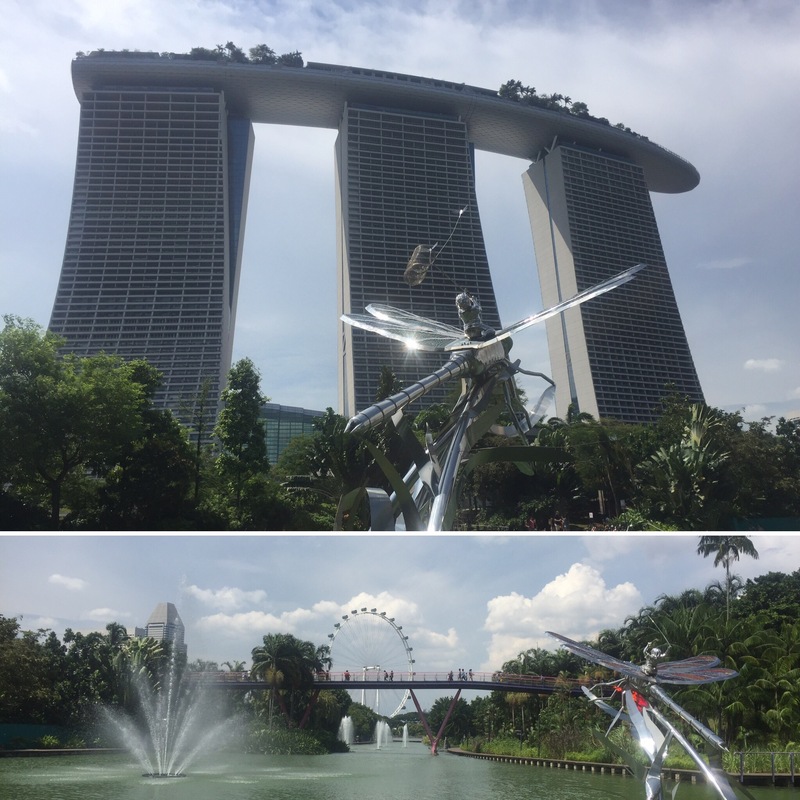 as he was the founder of modern Singapore. Our next stop was for our tea. We headed to the Lao Pah Sat food market that we had been to the day before which we were happy about as the place was enormous and had a huge range of food on offer. Niall went for noodles and I went for curry. Again, the food was great! Our guide also bough cendol and ice kacang ABC for us to try. 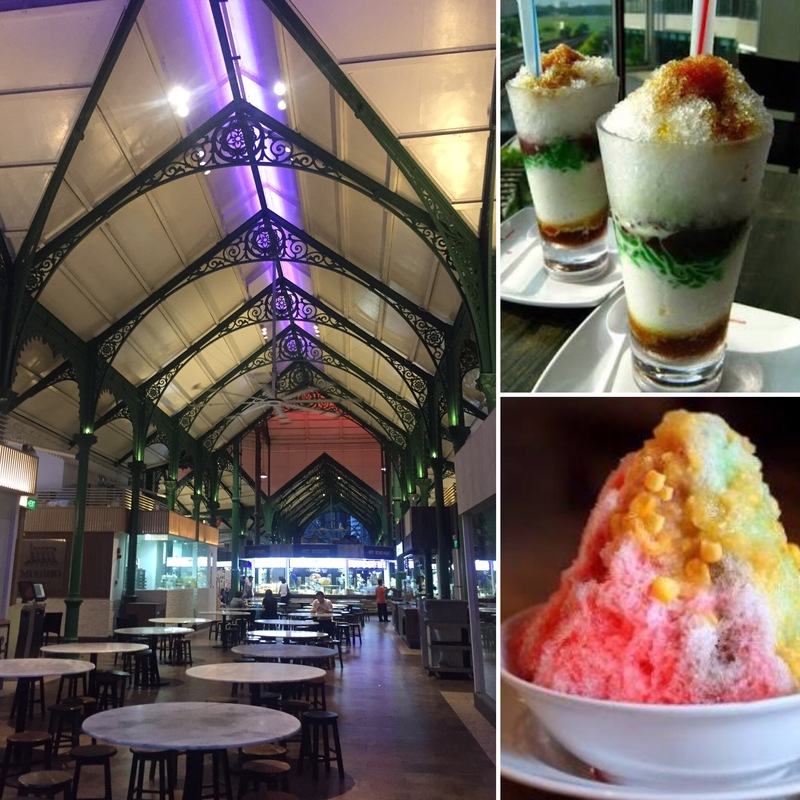 These are both Singapore desserts designed to cool you down on a hot day or after a spicy meal. The cendol was in a cup with shaved ice, coconut milk, green jelly noodles, sugar cane syrup and red beans. It was very tasty although Niall wasn’t much of a fan as he doesn’t like coconut too much. ABC looks more like a dessert and was covered in different flavoured syrups and then had a few different types of jelly and then red beans in the bottom of it. I think you can get a range of ABC as someone in the group got one that looked similar but had strawberries in it and a green jelly which looked a bit like caviar – it was all very nice! After tea we headed to the Spectra show that we had been at the night before. Despite being the same show it was still great to sit and watch it again. We then got to drive through the designer shopping centre by the river. 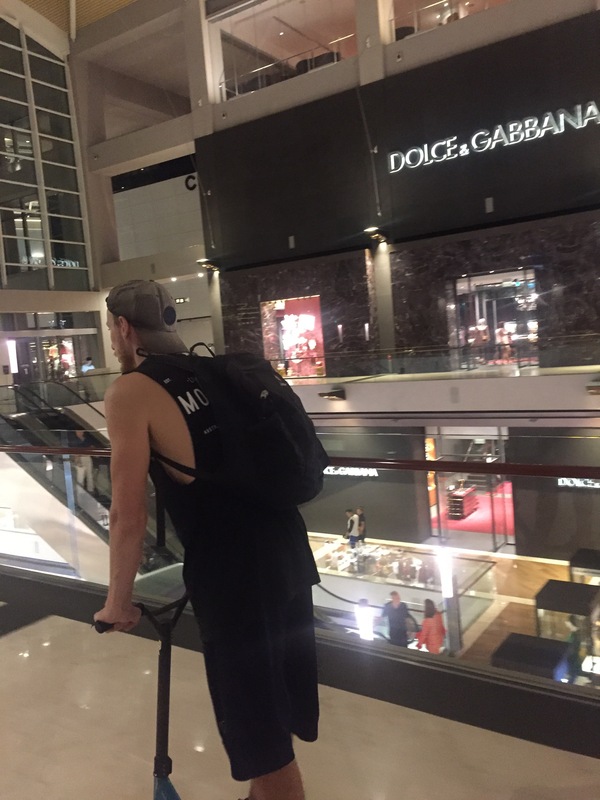 We would never be allowed to do this in the UK and it was quite surreal having 20 odd people scoot past the likes of Dolce & Gabbana and Dior! 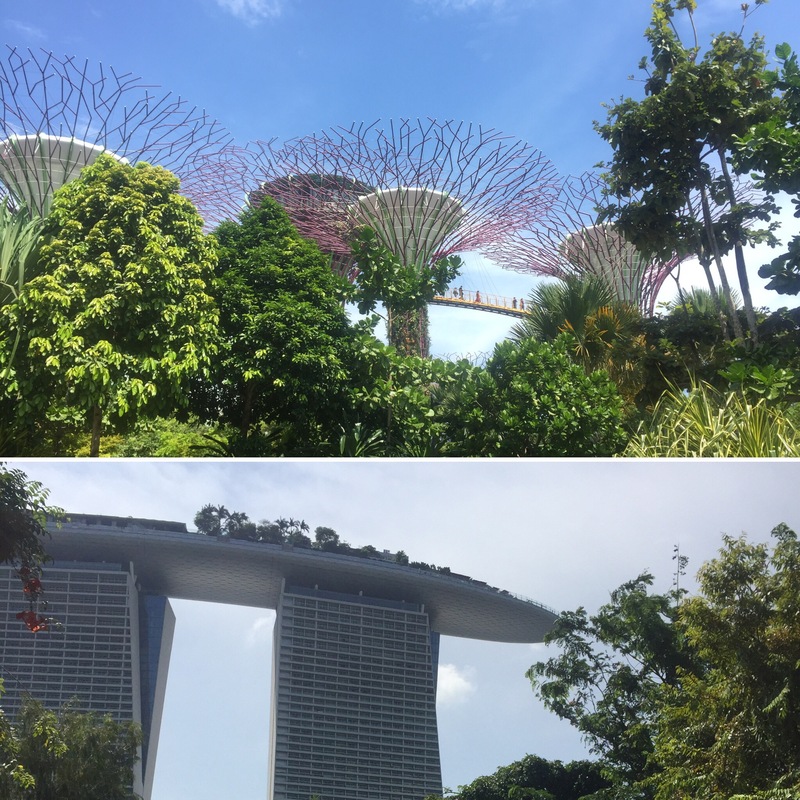 We didn’t have long between the Spectra show and the Gardens by the Bay show which was next on our tour itinerary. This was also good to see again and we got to scoot through the gardens a bit which was also really fun. 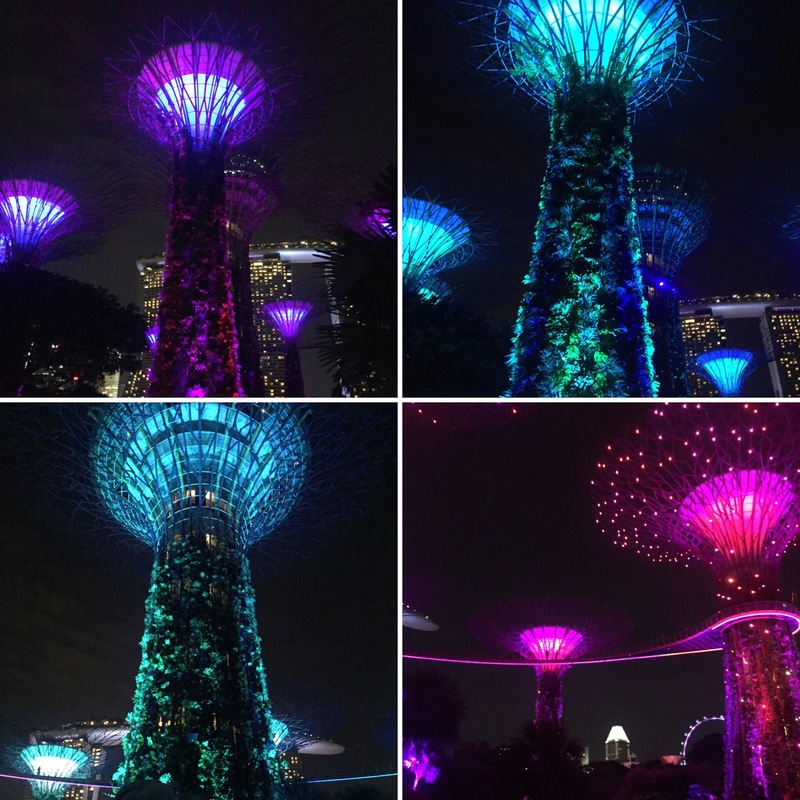 We were told that the Spectra show has remained the same in all the years that it’s been running but the Gardens by the Bay show changes every few moths meaning that, if you were to do multiple visits or lived in Singapore, you could keep going to see something new! 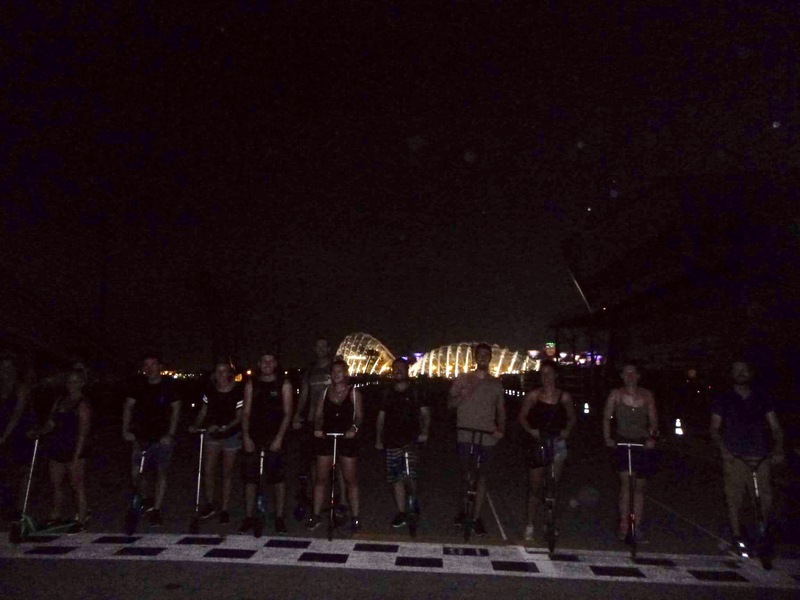 On our way back to the hostel (it was around 10pm by this point) we got to race along the Formula One race track! This was really cool and there was still some aspects of the track and pit stops along the side as the race has only happened the month before. 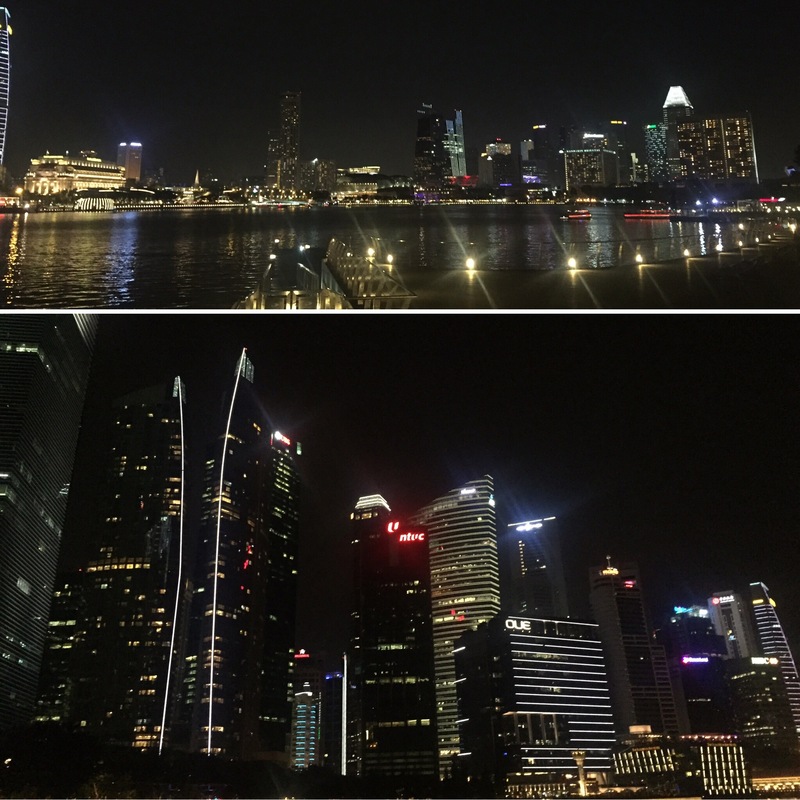 The Singapore Grand Prix is a night time race to exploit the amazing lit up skyline they have and it would be amazing to see it from the giant stands they have looking out over the water. The tour was great! 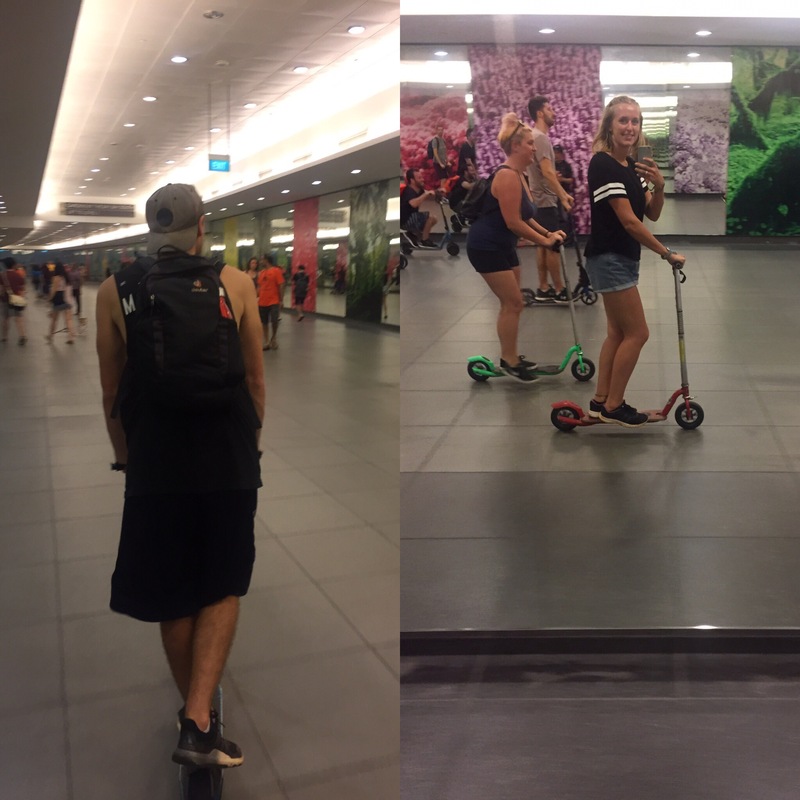 We were taken all over Singapore, got to try new foods and got to scoot in places I would never have thought would be allowed (and to be honest I’m still not 100% it was). 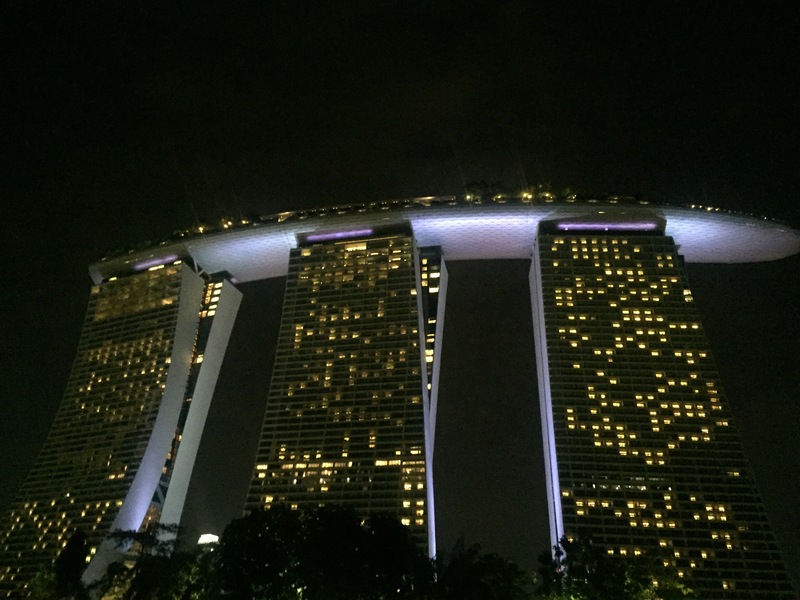 We were given a tip that on a Sunday the bar at the top of Marina Bay Sands is free to get in with no dress code but we had used the last of our money up and had to leave for our flight the next morning so didn’t get to go. The Inn Crowd was a great hostel to stay in in Singapore and the city itself is a great place to spend some time. We had a really good time here and it would definitely be somewhere I would visit again in the future!